Hope UMC is hosting over two weekends this October the Basic Course in Lay Servant Ministries. Have you felt that gentle touch or maybe a strong push to pursue your call to serve the church in a greater capacity? Now is your opportunity to join your brothers and sisters in Christ in the two day, 12 hour course to help you explore the opportunities for serving your church. Download the form below and send it to the address indicated. Also please include a short write up explaining why you would like to attend. Make sure to return it by October 10th. The course will be held at Hope UMC on the 22nd and 29th from 9am to 3pm. 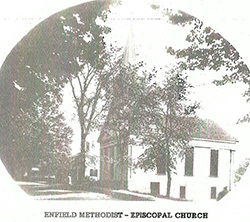 In the late 1930’s the Enfield, MA Methodist- Episcopal Church was dismantled in expectation of the coming of the Quabbin Reservoir. The building was reconstructed (minus the steeple) in the town of Palmer where it was used as the Grange Hall for many years. It was a church again for a time in more recent history and very recently the building was sold again. It has been purchased by the Amherst Railway Society as their new home. The president of the Society has personally invited us to come and see this historic building. They will be having an open house on Saturday, August 20th from 10 AM until 2 PM at 1130 South Main St. in Palmer. There will be tours of the facility and a chance to see their future plans. You will also be able to see an operating Belt Lines model railroad and partake of some refreshments. So, whether you are interested in Methodist history or are a railroad buff, this may be an event for you! Fashion Show is Big Success! March 17, 2016 Alice Collins Activtiy, Music Comments Off on Fashion Show is Big Success! I would like to thank everyone who helped to make our Little Black Dress Fashion Show such a success. The ladies who modeled along with me, Ruth Keller, Dawn Kresge, Pastor Aida, Ruthie Fernández, and Alice Collins were amazing and beautiful. Thank you to Ron Paré for making our tickets for the event. Thanks to Joanna Page who spent two days in the kitchen preparing soup. My humble gratitude goes to Debbie Dunbar for making the hall beautiful and spring-like. Thank you Tish Poulter for being our photographer for the afternoon. Thank you to all the men (George Button, Dennis Davis, Ingmar Eggen and Zach Murray) who came and served our meal, cleaned-up, and joined the ladies in supporting our fabulous models! And of course, a big hand to all those who bought tickets and supported this fun event. Keep your eyes peeled for all those women who will be donning some new spring clothing. I just love this church – everyone pitches in to make God’s work light and fun. AND, we give a huge thank you to Lois Paré for bringing this idea to the church and organizing the event! More pictures on our website! Ruthie, check out those shoes!